At this point in the regular season teams can be separated into two buckets. The first bucket is flush with playoff contenders; teams trying to figure out how to lock up playoff berths and realize success in the postseason. The second bucket is teams on the outside looking in. The rest of this spring, lottery aside, is meaningless. That means the off-season has already started, and so have the pre-summer postmortems. In Canada, there are three teams in the latter position. The Canucks and Senators appear to be a couple of years away from serious contention, but both teams have impressive young talent to build upon. Their summer will largely be spent trying to find pieces to complement their players as they likely head into another developmental season in 2019-20. Edmonton is a different story. The Oilers have to contend now because their two best players (and two of the best players in the league, quite frankly) are in the prime of their careers. You’ve heard the front office in Edmonton speak aggressively about changing something, but it’s not yet clear what that something is. The team is excruciatingly top-heavy and has a serious salary cap issues. It seems possible that they will try to pay teams to take on some of their more burdensome contracts this summer, but all that does is clear a bit of space. They still need to figure out what to do with that space. To Oilers CEO Bob Nicholson’s credit, he has been front and centre on Edmonton’s disappointing season and hasn’t shied away from tough questions about the state of the team. Moreover, Nicholson and company seem fully accountable. But it does sound like the front office is having difficulty assessing what has failed this roster. There was the “something in the water” line in January, and more recently, it seems as though attention has turned to some variation of “fixing the culture.” The one specific roster move we’ve heard the team talk about is the desire to acquire a top-two defenceman, but that is true for about two-thirds of the National Hockey League. The price to accomplish that goal will be unquestionably high. The one piece the Oilers have been missing with this retool is at the wing position. Edmonton’s gutting of personnel at this position to address other roster needs backfired twice over. They never did materially improve the rest of the skating group, but they absolutely submarined their talent on the wings. This should be the critical focus area for the Oilers this summer. They have no weaponry around their centre depth and it’s made them a relatively punchless offence. 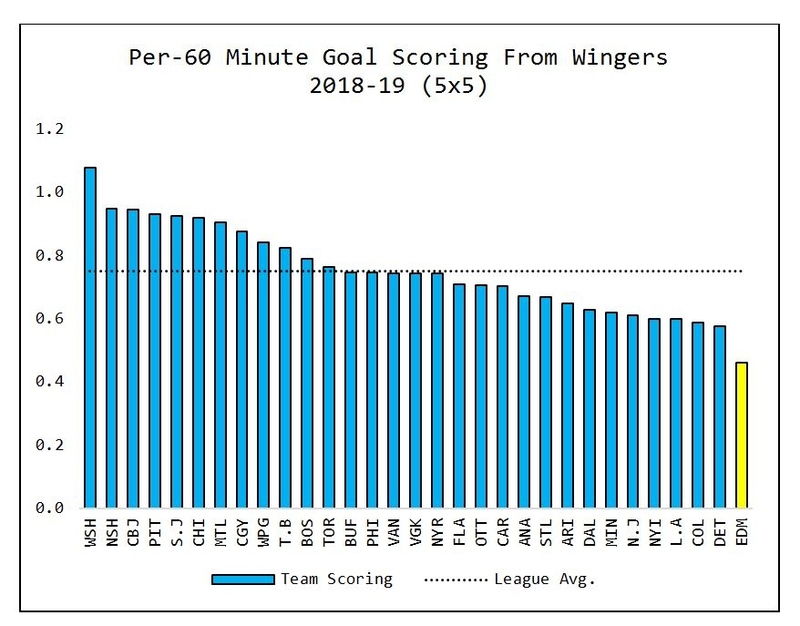 Back in 2016-17, the Oilers averaged 0.7 goals per 60 minutes from their wingers in 5-on-5 situations (12th in NHL), and 0.8 goals per 60 minutes from the same group in all situations (18th in NHL). Those are decent numbers – decent enough to drive a team into the playoffs. But it was largely driven by scoring from the likes of Patrick Maroon and Jordan Eberle, two players the Oilers moved on from. The third weapon on the wings that season was Milan Lucic, whose game has effectively gone into the tank over the last two seasons. In other words: these are three players Edmonton never really backfilled, having already lost superstar winger Taylor Hall the year prior. 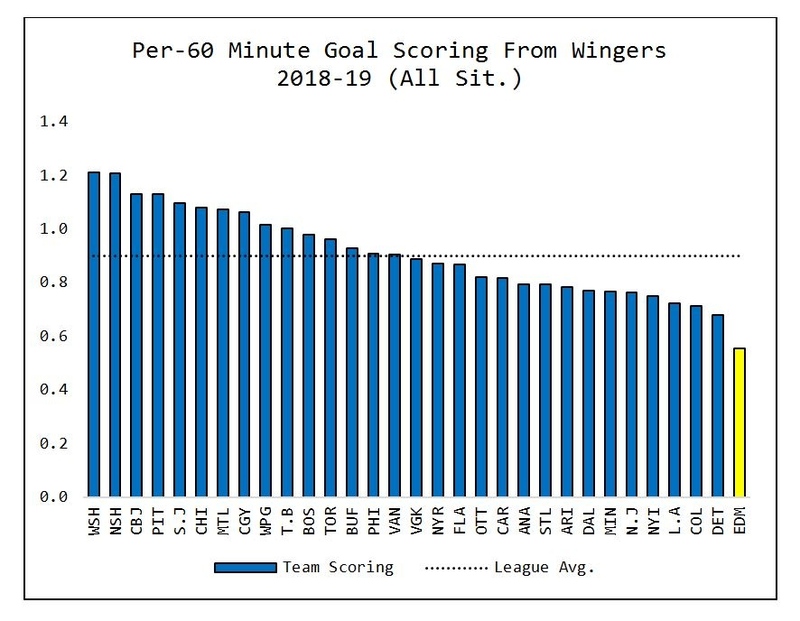 In summary, Edmonton is about 40 per cent less productive than the average NHL team when it comes to offensive production at the wing position. The good news is that relative to the acquisition prices we see for centres and defencemen, winger talent is easier to come by. The bad news is that, again, Edmonton is tight against the cap and doesn’t have a lot of flexibility to spend right now. Focusing on upgrading at the wing position is critical for the organization this summer. It’s a clear, quantifiable objective – something that could sizably move the needle and push this team back into the postseason. But right now, Edmonton seems to be talking more about chasing whatever magical elixir was swirling around the locker room during their 2016-17 campaign. That season, you may recall, was driven in large part by just having quality goaltending. This year’s Edmonton team, with just the save percentages from their 2016-17 season, would be 41 goals better in the standings. Add some significant talent upgrades at the wing position, and you have a playoff contender. Nicholson and the rest of the front office have a brutally difficult job ahead and an increasingly impatient fan base. It’s not a job I envy by any means. But a step in the right direction could help bring Edmonton back into contender status rather quickly. The first step requires understanding the root cause of failure though, and I’m not sure we’ve seen that just yet.